Last week I wrote (albeit, briefly!) about my experiences at The Canadian Association on Gerontology annual meeting (check it out HERE!). What I didn’t talk about was the interesting ‘Chair Yoga’ session put on by Annette Wertman of Ageless Yoga. 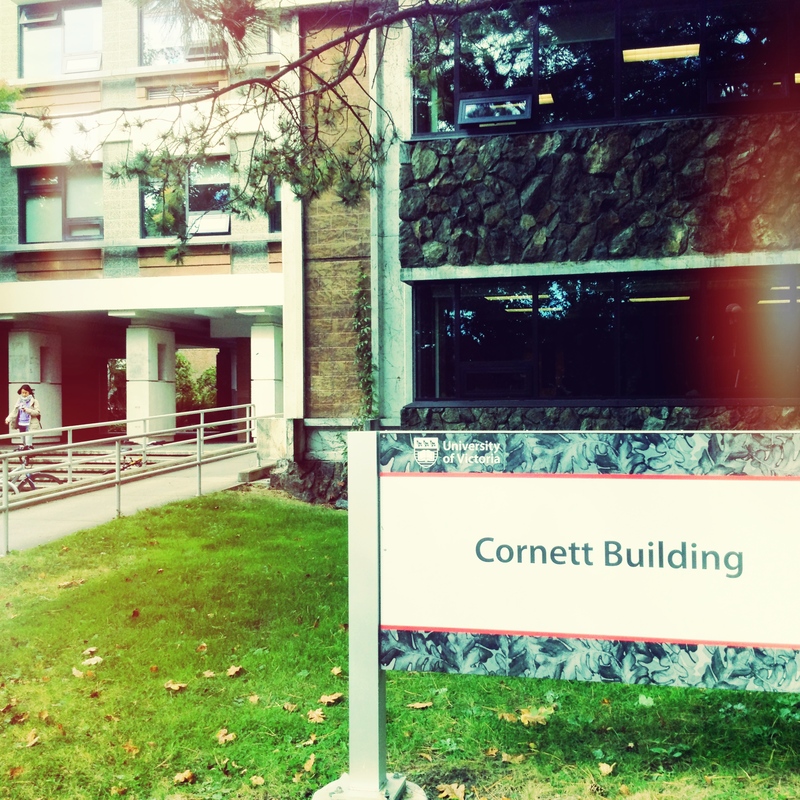 Annette is in the data analysis phase of her MA (at Simon Fraser University) examining “Yoga and the Older Adult: An exploration into pathways, barriers and experiences“. Her workshop focused on tips for offering chair yoga classes and the benefits she sees from her own teaching experiences. It was refreshing and inspiring to end the conference weekend with some yoga TLC – Annette, it was just what I needed! It’s great to bridge the gap between the research and yoga communities! Chair yoga is the adaptation of yoga poses that use the chair (either seated or standing) for support. It can offer modifications for people who have difficulty getting up off the ground, poor leg strength or balance. It’s also easier on the bones and joints (especially knees). Annette offers this class to older adults, but chair yoga is also a great option for those who work in offices and schools to do during breaks throughout the workday! 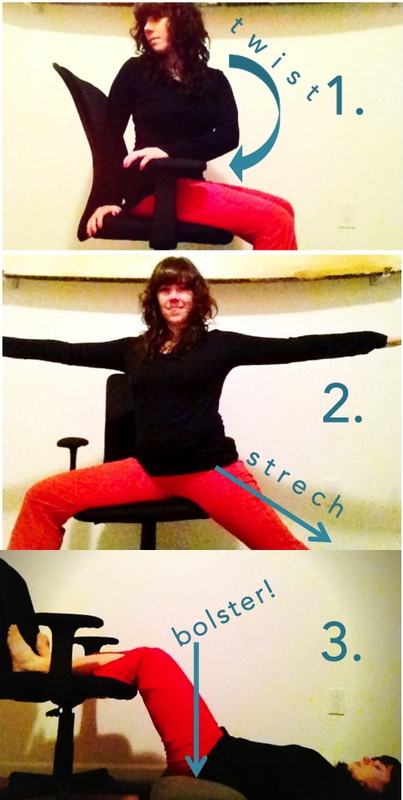 Here are 3 of my favourite chair poses. It takes 5mins, so try them when you first wake up, during your lunch break or to help you get through that late afternoon slump! 1. seated twist (for SPINE). sit up tall and feel your sits bones on your chair. engage your core. place one palm on seat of your chair and the other on the arm or side. enhale and twist from your navel, waist, ribs, chest, shoulders, and neck. keep chin near your shoulder. to release, exhale and reverse twist. 2. warrior II (for HIPS). sit with your right leg resting across the chair, foot flat on the floor. reach back with your left leg, placing your left foot on the floor pointing out at a 45degree angle. you should feel a stretch through your left hip and feel supported by the chair on your right. hips should be square (as your hip flexibility allows), spine long, and shoulders away from your eyes. reach arms out in either direction. 3. legs up on chair (for RELAXATION!). lay on your back (on the floor) and place a bolster under your hips. rest your calves on the seat of the chair. take 5 mins to breath and feel the relaxing effects of the inversion. My Fave! NOTE: if you live in the Vancouver area, Annette will be running a chair yoga workshop at the Vancouver Yoga Conference, so check her out! 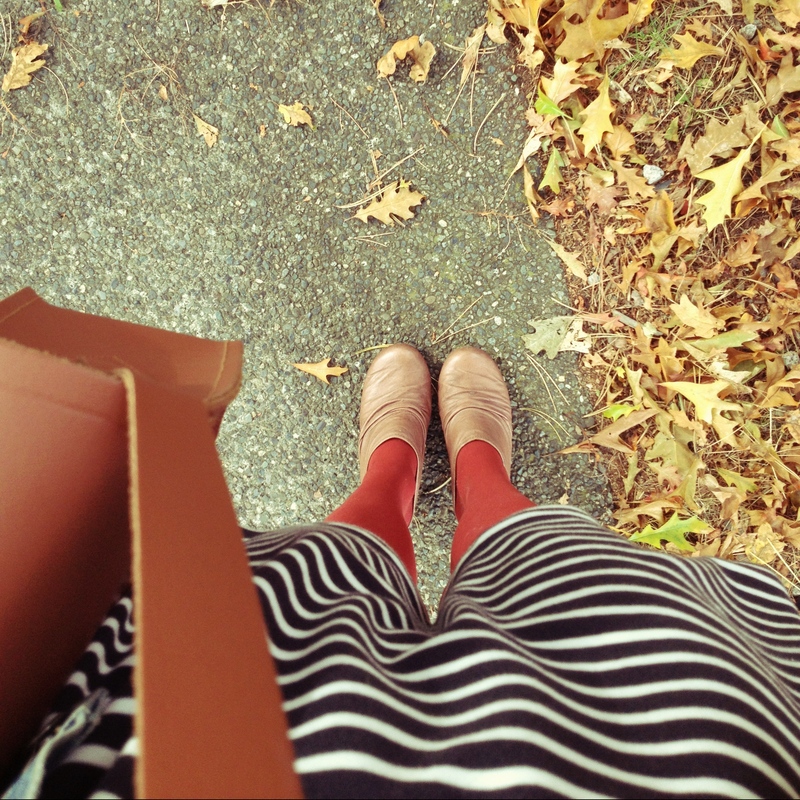 i’m starting a new regular post called “my favourite things“. there is so much stuff & information out there and it’s hard to know what’s worthwhile. Whether it’s yoga gear reviews, Parkinson’s resources, or basic clothes and shoes, I’ll share my humble opinion and let you know what I’m interested in! Whadya think? Bring on winter rain! 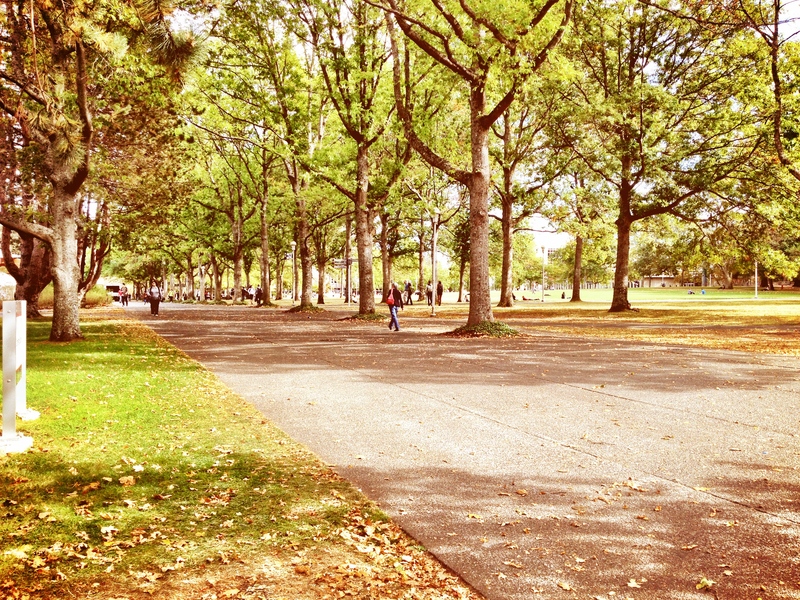 I’m starting a new regular post… from research to real life. There’s so much information out there, it’s hard to keep track of it all! I will present new (and exciting!) research in both a scientific and news media format, so the ideas come across in whatever way you choose to get your information! I thought this was an interesting article on calcium and dopaminergic neurons. The main idea: calcium stresses dopamine neurons, leading to premature aging and cell death. There is ongoing research into drugs that shut down Cav1.3 (a membrane protein that controls calcium release) to relieve stress on dopamine cells… and may slow disease progression. 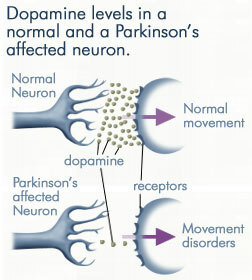 Real life : Parkinson’s breakthough could slow disease progression – Dementia News – –. 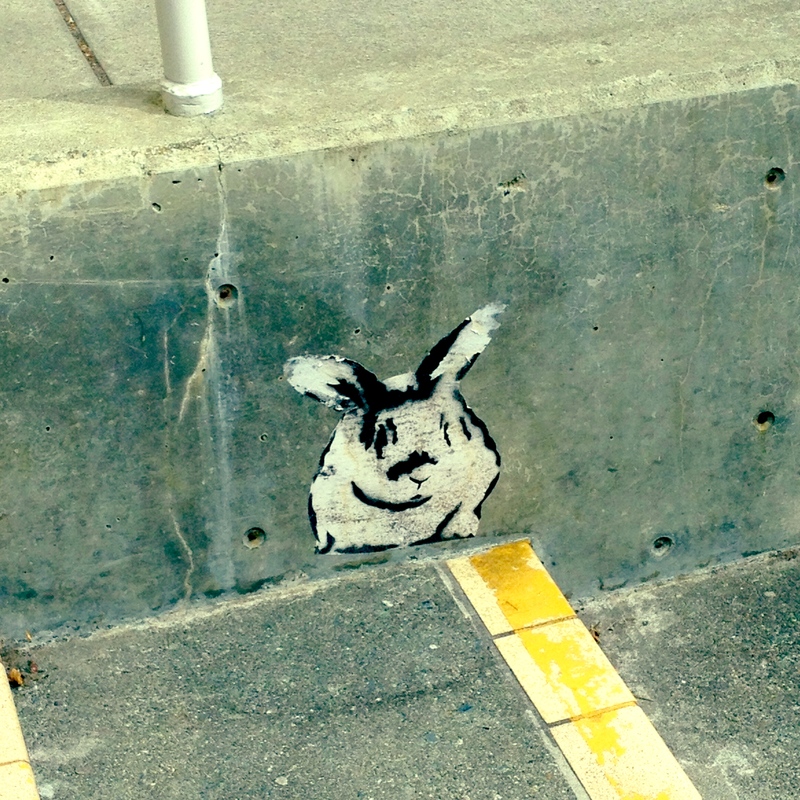 last thursday i boarded an early morning ferry, and found myself on the mainland. I had a big conference weekend ahead of me at The Canadian Association on Gerontology. The first day, I took a great student workshop on how to “market yourself in gerontology”. I love re-connecting with fellow students and seeing all the successes they’ve had over the year (you know who you are!)! Senior & baby-boomer bloggers are taking over – seriously, they are adventurous and funny! advertised use vs. that proven in clinical trials? The CCNA will create a Canada-wide network aimed at innovative and collaborative research. Researchers will be able to start applying to be part of this network this fall and workshops early next year will integrate the groups into one large network. This approach encourages Canadian dementia researchers to work together in new, collaborative ways to solve brain disorders. You know I will be staying up-to-date to see how this rolls out and how I can get involved in this innovative initiative! If you want more information, there’s a great online webinar HERE . and hanging out with these two gents… lucky me! much love. here is a link to a (very nice!) article published by UBC Okanagan about my recent PhD. I am the first PhD to graduate from the Faculty of Health & Social Development and they were nice enough to write about my research & accomplishments… how sweet. I’m feelin’ the love! 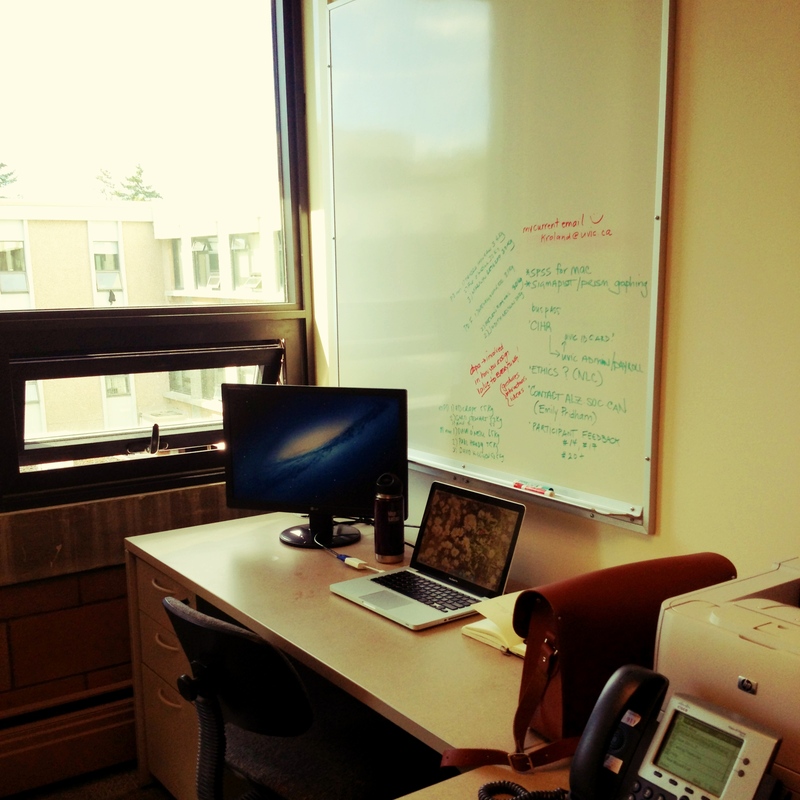 Today, I officially started my POST-DOCTORAL FELLOWSHIP at The University of Victoria. I wandered around to get my bearings and scope out the best coffee spots. … if you’re in the neighbourhood, stop by and visit! my desk… check out the windows in my office, they open!! And, I already have a great new friend to keep me company. Wish me luck! much love.